Hyundai Mipo Dockyard’s a LNG bunkering vessel. Hyundai Mipo Dockyard said Thursday it has signed a $77 million contract to build what will be Korea’s first mid-sized liquefied natural gas (LNG) carrier for a foreign shipping company. The Korean shipbuilder will deliver the 30,000-cubic meter ship to Norway-headquartered shipping company Knutsen by the first quarter of 2021. The contract includes an option for an additional sister vessel, Hyundai Mipo said. The vessel will be used to supply LNG from the eastern part of Italy to Sardegna Island in the Mediterranean Sea. The LNG vessel will be 180 meters long, 28.4 meters wide and 19.4 meters high and feature a dual fuel engine that uses natural gas and bunker fuel to convert chemical energy into mechanical energy, an efficient option for shippers to meet tougher environmental regulations, Hyundai Mipo Dockyard said. Demand for mid- and small-sized LNG carriers is increasing amid growing consumption of LNG and expansion of LNG bunkering facilities. The latest order indicates Hyundai Mipo’s full entry into the mid- and small-sized LNG carrier market. 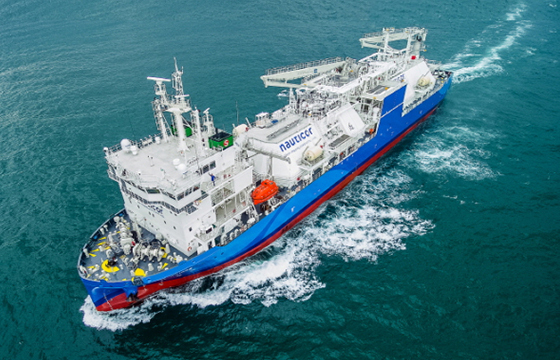 In October, it successfully delivered an LNG bunkering vessel to Germany’s Bernhard Schulte.